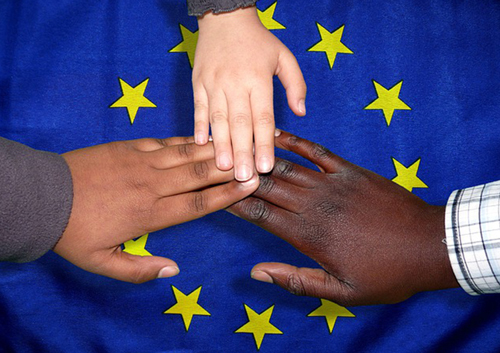 The integration of newly arrived migrants into their host societies is a task many EU member states governments are currently preoccupied with. Especially, the integration of refugees into work life is a crucial element for successful overall integration. However, the official procedures for the recognition of competences and skills of the newly arrived migrants are very long and bureaucratic. Especially, in Germany a culture of certificates is preeminent where skills and competences that cannot be demonstrated by a certificate are not recognized by the competent authorities. Hence, migrants have to attend vocational trainings for approximately three years to acquire skills they already have. This underwhelming environment leads to decreased levels of motivation and high dropout rates, which deprives migrants of access to the labor market, leading to a very high rate of unemployment among foreigners in many EU countries, and thereby hampering integration efforts. In addition to this problem, the SME sector has been lamenting the troublesome shortage of skilled workers. This shortage will only increase in the coming years due to demographic change, i.e. less young people. However, this trend is accompanied by an increased number of SME founders retiring and not enough qualified personnel to take over or start new businesses. Currently, more jobs are lost annually due to failed business transfers than new ones are created by business start-ups. Individual coaching and placement into long-term SME jobs. These measures are directed towards the target groups newly arrived migrants, SMEs, public administrations and other organizations involved in the assessment and recognition of competences, as well as qualification and integration of migrants, and politics on the local, national, and EU level. The project is carried out by seven partners from Germany, Poland, Italy, Austria, and Finland, and is co-funded by the Erasmus+ Program of the European Union. The timeframe is from January 2018 until January 2020, i.e. a duration of three years. Project management and process evaluation, as well as the implementation of six transnational partner meetings and two multiplier conferences. The development of regional action alliances in each partner country and international cooperation, creating an environment open for the support, qualification, and integration of migrants. Identification of individual competences of migrants, and on this basis, consultations on further professional careers and necessary qualifications, as well as individual consultation measures. The development and implementation of three comprehensive further vocational training program, namely a) business administration, finance and accounting, b) energy efficiency and renewable energies, and c) digitalization, CAD and 3D printing, and if needed, professional language trainings. Individual coaching programs for each participating migrant to provide support from the first training until entry into work life. Transfer of project results to 68 chambers and universities/universities of applied sciences from 13 countries, which are involved as associated project partners during implementation and receive sustainable implementation advice and carry out further dissemination activities. A high sustainable use is ensured by means of a process-oriented expansion of the implementation regions, including financing.